This week on The Digital Story Photography Podcast: Analog Efex Pro 2 from Nik Software, Top Shape Camera, Bay Bridge Spectacular, and the $99 Fisheye - All of this and more on today's show with Derrick Story. Story #1 - The Weekly Update: MBLOK - One memory for all devices. Always by your side - This 256GB storage cube could change the way you use your mobile devices. 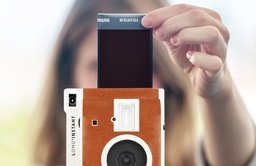 In other news, Lomo Instant, the world's most creative instant camera system also has a Kickstarter project. Story #2 - Top Shape - More and more, I see similarities between our digital cameras and high performance automobiles. One of those being the value of a little TLC. In this segment, I talk about firmware updates, LCD screen protectors, multicoated filters, and cases. Story #3 - The Nimbleosity Report: The Olympus 9mm f8.0 Fisheye Body Cap Lens was put to the test this last weekend during a twilight shoot at the Bay Bridge. This super nimble $99 lens turned out to be quite a performer. Story #4 - From the Screening Room - Portrait Project: Changing a Sky Background with Chris Orwig. This is a handy technique to know, not only for bland skies that need a little oomph, but any selection and mask in a photograph. You can watch Chris in action by visiting the TDS Screening Room at lynda.com/thedigitalstory. While you're there, you can start your 7 day free trial to watch other design, photography, and computing titles, plus every other topic in the library. May is Wow and Double Wow Month For Graduation, Engagements, June Weddings, Birthday, Fathers Day ... and, because SizzlPix! loves making you a super hero with a camera strap around your neck, order TWO: one for them; one for yourself, and your second SizzlPix! is 25% off! Any two SizzlPix!, from the same image or two different, any sizes, any hanging options, save 25% on the second or more. Photo Assignment for May 2014 is "Around the House".